New live sketches every week! Standup comics to warm up the crowd! Multi-cameras recording live throughout the night! 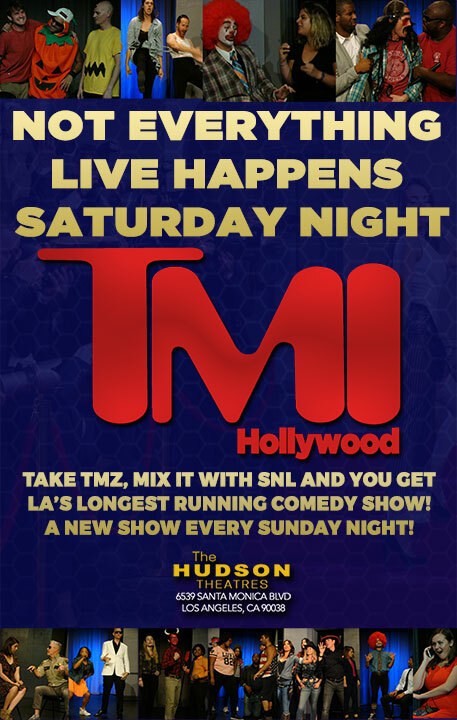 Every Sunday night, TMI presents an all-new hour of sketch comedy, commentary and musical theater, based on the stories of the week in entertainment, celebrity and pop culture. Each week, a celebrity guest joins our cast to “host” the show and take part in the fun and one of LA’s best upcoming bands or musicians perform. Nothing is off limits. Nothing is too silly or trivial. Nothing is too controversial. Every time Bieber opens his mouth, Trump opens his Twitter or Kim Kardashian opens her… well, you know, TMI is there, with its own unique and hilarious take on the story. The world is obsessed with celebrity culture. Who’s hooking up, who’s hanging it up and most importantly, what were they wearing when they did it. Websites like TMZ, Perez Hilton, Hollywood Life and Just Jared have some of the most loyal and rabid fans online, while television networks like E! and Bravo not only feed our need for celebrity information but create celebrities of their own with shows like Keeping Up With the Kardashians and The Real Housewives. In short, we love celebrities… almost as much as we love to hate them. Out of that idea came TMI Hollywood. It’s located four blocks East of Highland Ave and five blocks West of Vine. North side of Santa Monica Blvd at the corner of Hudson Ave. at the gateway to Theatre Row Hollywood. There is valet parking available on Hudson Ave. Give yourself 20 – 30 minutes ahead of your arrival time because of traffic. There’s a café in the lobby for snacks and refreshments. Take your cameras, have your phones charged, and don’t use a flash to record. It is important to remain quiet with respect to the show, unless it is time to laugh or interact with the cast.